After all the expensive wheel clamps, red and white paint and other equipment, it turns out that all that might be needed to stop people from parking illegally are 10-baht water bottles. VDC Volunteer Jaran Kongbandit points to the office’s new solution to illegal parking. 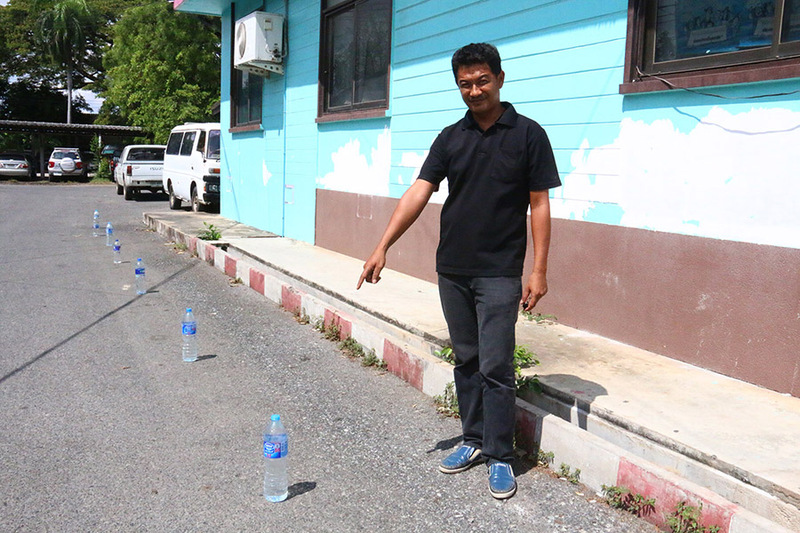 Sattahip District Chief Noraset Sritapatso said Village Defense Corps officers originally placed small bottles of drinking water near red-and-white curbs to stop dogs from urinating there. But it turned out drivers stopped parking there as well. VDC Volunteer Jaran Kongbandit, after following the district chief’s orders, said many things had been tried to prevent people from parking in the prohibited zone, with no effect. But some reused and filled water bottles did the trick. District officials don’t understand it, but they’ll take it. Don’t be surprised to see water bottles appearing on pavements around the district.